For almost 20 years, NASA’s Cassini spacecraft has travelled through space, sending back photos and valuable information from Saturn and two of its potentially habitable moons, Enceladus and Titan. On 15 September 2017, the craft will take its final loop, and then dive through Saturn’s atmosphere, burning up in the process. A new study of data collected from Cassini’s flybys of the ice-covered moon Enceladus shows the presence of molecular hydrogen, likely emanating from hydrothermal vents in the ocean beneath the ice. The abundance of hydrogen creates a chemical disequilibrium that, on Earth, supports microbial life. DCO Deep Energy Community member Christopher Glein (Southwest Research Institute, USA) and colleagues describe their new findings in a recent paper in the journal Science . In certain marine hydrothermal vents on Earth, serpentinization reactions between seawater and iron-rich rocks lead to the formation of warm, mineral-rich, high pH fluids. The reactions generate large amounts of hydrogen, and in the presence of carbon, results in a high chemical potential for producing methane and various organic compounds. Many astrobiologists argue that hydrothermal vents may have been the site where the first cells evolved, making vent systems an important place to look for life elsewhere in the solar system. Glein, who first began working on data from the Cassini-Huygens mission as a graduate student, began to suspect that Enceladus might be producing hydrogen when previous results indicated that Enceladus has fairly alkaline ocean water. Cassini made eight close flybys of the moon, the most recent and final one in 2015, crossing Enceladus’ “tiger stripes,” four parallel crevices near the south pole where water vapor, ice particles, and methane erupt from the cracks. Using Cassini’s onboard Ion Neutral Mass Spectrometer, the craft detected evidence of molecular hydrogen in the plume produced by the tiger stripes. After ruling out other potential sources of hydrogen, the team concluded that hydrothermal processes are the most likely source of the detected gases. Additionally, the great abundance of hydrogen in the plume reveals that there is a chemical disequilibrium in Enceladus’ ocean, which could support methanogenic microbes capable of forming methane from carbon dioxide and hydrogen. 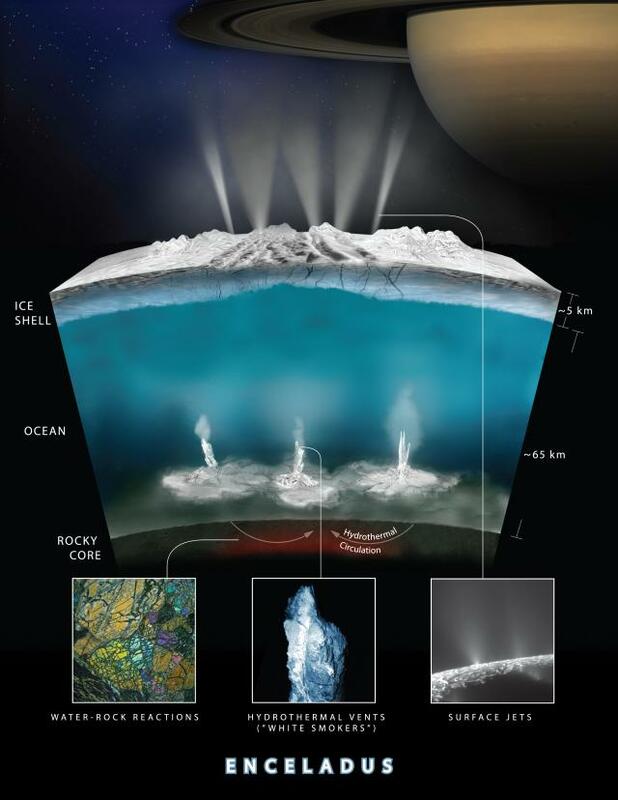 “If correct, this observation has fundamental implications for the possibility of life on Enceladus,” wrote Deep Energy Community Member Jeffrey Seewald (Woods Hole Oceanographic Institute, USA) in a commentary in the same issue of Science . While the findings are compelling evidence for a hydrothermal vent system on Enceladus, Glein points out that the results are not yet definitive. Glein is working with a group to prepare a proposal to return to Enceladus, but even if NASA selects their project, the mission wouldn’t arrive before 2030. In the meantime, Glein is on the science team for Europa Clipper, a mission planned to depart in the 2020s that will conduct flybys of Jupiter’s moon Europa, a large ice-covered moon with a liquid ocean that also may be capable of supporting life.